Instead let's talk about the music within their third full-length album, Black, Blue & Violet. Midryasi has made it quite clear what they've been after from the beginning. They blend classic heavy rock with elements of doom, stoner and psychedelic rock. Curiously, most of the material is not slow enough to be authentic doom rock, but you get the vibe anyway. What you get in most every song is an ambitious mixture of the elements. Listening to the title track, Behind My Ice or The Nuclear Dog, you find them intricate enough for the music to approach progressive rock. If you called this heavy prog stoner rock, I wouldn't necessarily quibble with you. Additionally, there some nice guitar work from Paul P, mostly dripping with that psychedelic groove. Udz, yeah that's his name, offers old school Hammond organ than synths for the keyboard parts. 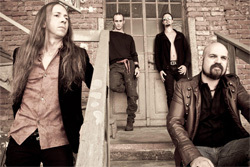 Vocalist Convulsion (no, I'm not kidding) has a straight forward clean style, with a sometimes haunting feel. Don't expect much on the lyrical side of things, it's mostly nonsensical abstractions. Black, Blue & Violet is also a short album, timing at about 37 minutes. In the end, while interesting and offering some novelty, I'm not sure this something that I would return to on a regular basis. 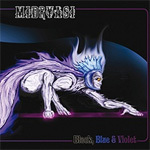 Nevertheless, Black, Blue & Violet can be recommended to any fans of heavy, stoner, or psychedelic rock. Midryasi's Black, Blue & Violet offers interesting, even novel, blend of heavy, stoner, and psychedelic rock that should tap the interest of fans of the same.